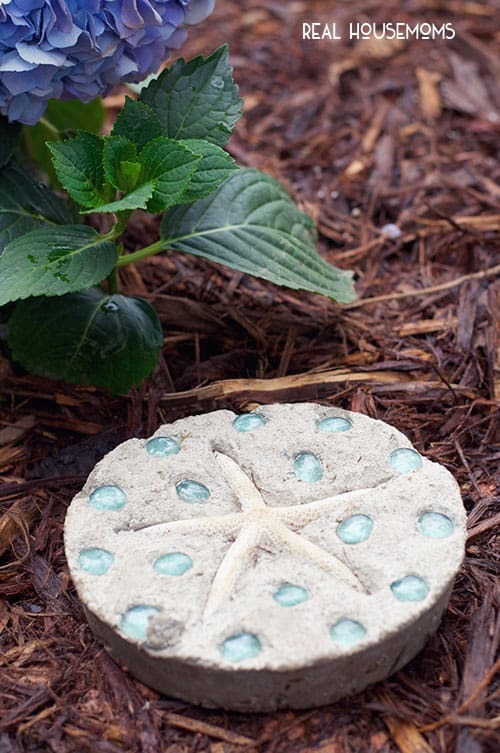 Dress up your garden with some easy to make DIY Garden Stones! You can even let the kids help decorate them! Ever since Spring I’ve been working on getting my flowers beds in order. I finally got everything planted, now I just needed to add some decorative accents. I’ve been wanting to make some garden stones for awhile now and I thought it would be the perfect time. I looked up a couple ideas on how to make them (which is super simple) and ran out to get my supplies. I ran to Lowes for most of my supplies. 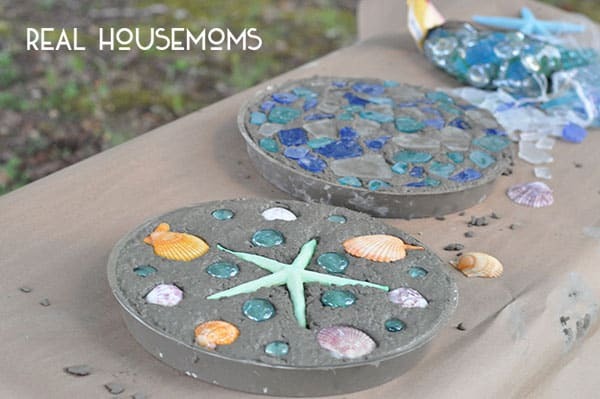 I was able to grab the fast setting concrete ($4.00) and the plant trays ($2.00 – $3.00) then I headed for to the craft store for my decorative glass. I was super excited to get started on this project. It’s my first garden/outdoor project ever! 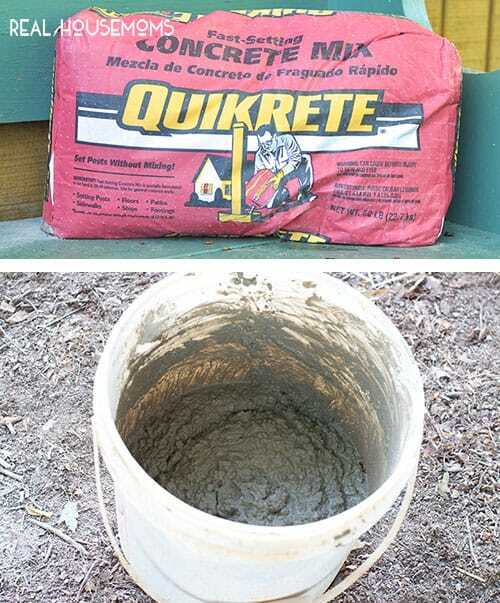 For mixing your concrete I just followed the directions on the bag. I mixed it up with a large wooden spoon. Super Easy, the only thing I suggest it not adding too much water any making it runny. Once the concrete was mixed we poured it into our mold. Then smoothed down the top with our wooden spoon. 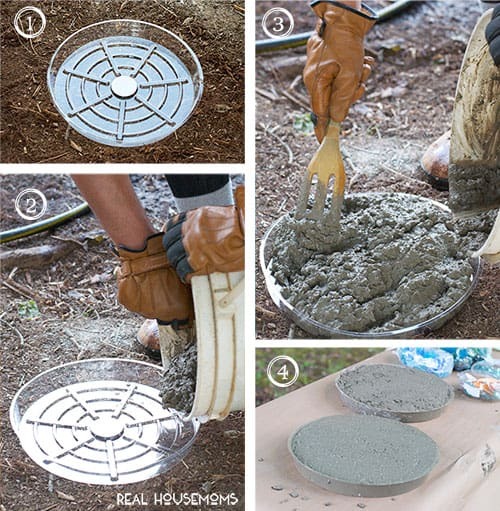 Now this is fast setting concrete so your going to need to move fast with this part! 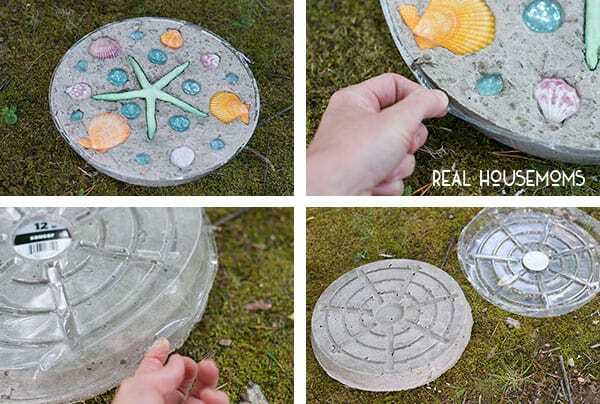 Push down your glass beads/shells firmly into the concrete. They go in pretty smoothly, which it great! See super simple so far, right?? Then wait 40 minutes for the concrete to completely dry. Once the stones have hardened you can easily remove them by loosening up the side and then popping them out. 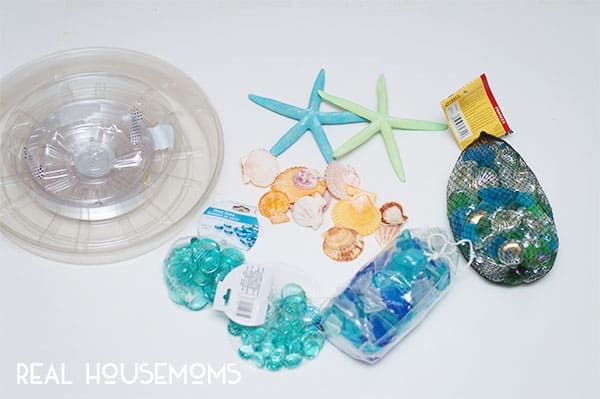 Plus the best part you can reuse the plastic molds. Now I have some cool garden stones for my flower beds and I had them done in no time. Next I plan on having each of my 3 boys make one with their names and handprint. Plus you can personalize them anyway you want. I’ve seen some pretty detailed ones on Pinterest. 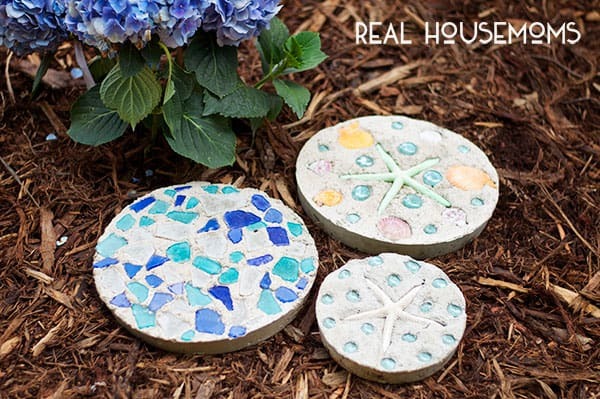 As you can see the garden stones are pretty inexpensive to make and so easy to do. I think the shells look really cool in the center of them as well. I can’t wait to make more now! I plan on doing several more projects for my flowers bed, I’ll keep you posted! I hope you loved this craft. If you’d like to get more craft project ideas and inspiration stop by my blog! 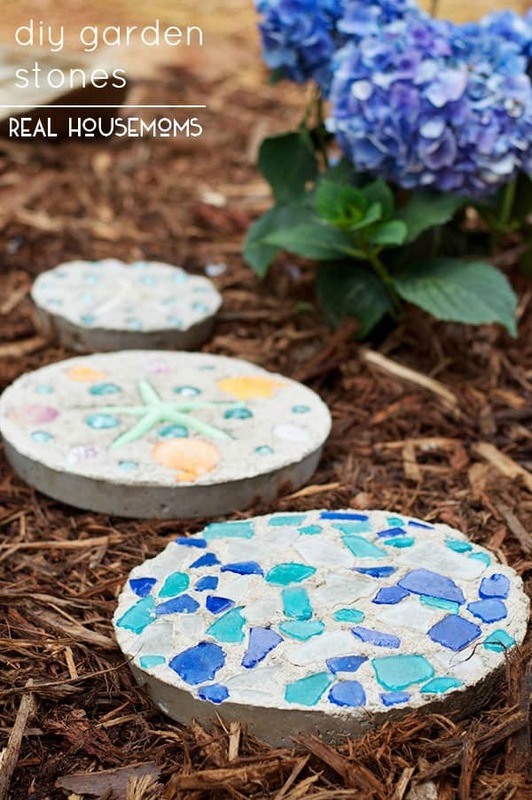 Those are some really cute stepping stones! I love how easy it is to add some decoration to the concrete. 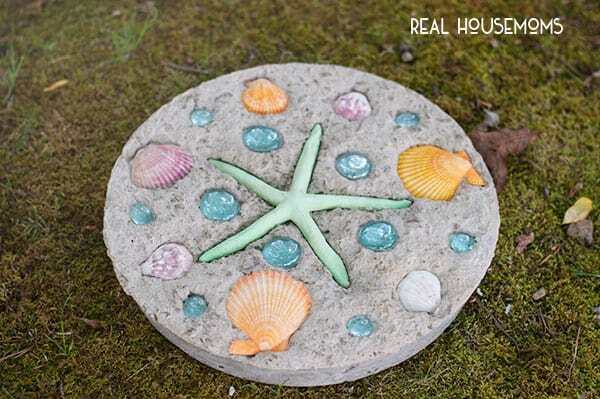 Whether it’s shells, decorative glass, or even patterns, adding some patterns and designs can really liven up simple concrete stepping stones. Thanks for the tips! It’s a good idea. And a nice project. Thanks for the inspiration.… I love it.